A reboot (or restart) of a wonky Android device solves problems ranging from apps freezing or crashing to the device itself slowing to a crawl. 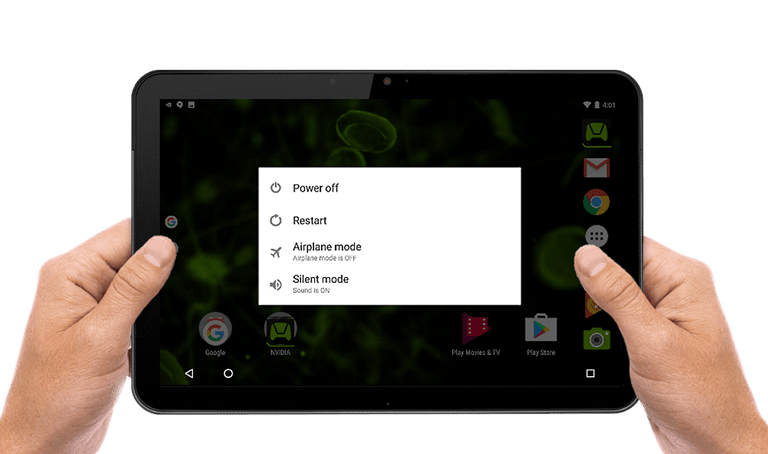 A common misconception is that our tablet or smartphone is powering down when we push the power button on the side or we leave it inactive for a while, but this only puts the Android device into sleep mode. A proper reboot will close all of the open apps and purge the memory of the device. However, with so many different Android smartphones and tablets, the process of rebooting isn't always straightforward. While the specifics may differ, the directions below should generally apply no matter who made your Android phone: Samsung, Google, Huawei, Xiaomi, etc. The easiest way to reboot your tablet or smartphone is by pressing down on the power button and holding it down for several seconds. The power button is usually on the right side of the device. After a few seconds, a menu should appear with the Power Off option. If you have the latest version of the Android operating system, you may have other options including Restart. It's best to choose Restart if it is available, but if not, don't worry. The only real difference between Power Off and Restart is the need to press the power button again after the screen goes dark. You may need to hold this button down for three to five seconds before the device powers back on. Even when the Android operating system can't display the power down menu, you can perform a hard reboot, also called a hard restart, which is not to be confused with a reset or manufacturers reset of the device. A hard reboot gets things back into operating order. This process can get a little trickier only because not every Android device is programmed to do a hard reboot the same way. Many devices will reboot if you simply keep holding down the power button. It may take 10 to 20 seconds before the system reboots. If it doesn't reboot after 20 seconds, you should move on to the next step. You should always try the first two methods first. They both operate by telling the operating system to run the shutdown process. But if the operating system is not responsive, you can tell your Android smartphone or tablet to power down immediately by holding down both the power button and the volume up button. You may need to hold these down for up to twenty seconds before the screen goes black, which will signal that the device has powered down. Not every Android device will immediately power down with that method. A few may require you to hold down the power button and both volume buttons, so if you have no luck holding down the volume up, try holding down all three buttons. This only works if you have a removable battery, but it can be a great backup if you have exhausted all other options. Obviously, you should only do this if you are comfortable with removing the battery from a smartphone or tablet. You should not touch the battery or any components on the device with your fingers. Instead, use a piece of plastic like a guitar pick to pop the battery out. Some devices include a battery lock or switch that must be pressed to pop out the battery. You don't always need to reboot to solve problems. If your device is running slow, simply closing a few apps may do the trick. When you leave an app, Android keeps it ready and available so that you can quickly switch back to it. You can view the most recent apps by opening the task screen, which displays the most recent apps in a cascade of windows that you can scroll through by swiping up or down. If you tap the X in the upper right corner of the app's window, Android will quit the app completely. How do you get to the task screen? On Android devices with three buttons at the bottom of the screen, simply tap the button on the far right with the square or two squares on top of each other. It may be a physical button below your screen, or for devices like the Google Nexus, they may be on-screen buttons. On newer Android devices, the Recently Used Apps may be on the left side of the bottom navigation menu. And you can either close open apps in this view by pressing the X on each app, or you can tap the Close All button at the bottom of the screen to close all of the open apps. Some tablets have the same options. If these options don't work for you to close your open apps, you may need to either press-and-hold or double tap the Home button. This button may look like a circle or have a picture of a house on it and is typically in the center of the bottom three buttons or on the bottom navigation menu. Holding or double tapping the button should bring up a menu with several options including one for the task manager. On some phones, the button will have an icon like a pie chart.